Imogen's Typewriter. : 2014 in Reading! In 2014 I read 56 books or 14030 pages. That's pretty amazing to me. That's just over one book a week and I could not be happier. I've reviewed all of these books in my 'Books I Read in..' series and in separate book reviews and I'm 56/200 books reviewed for my 30 before 30 list. 2014 was a pretty good reading year! There were 13 books I rated ✮✮✮✮✮. I rated 19 books as ✮✮✮✮. I rated 16 books as ✮✮✮. I rated 3 books as ✮✮. And only 2 books as ✮. So lets give out the Imogen's Typewriter Award for Favourite Book of 2014! 3rd place goes to To Kill A Mockingbird by Harper Lee (originally reviewed here). I read this book last month and I'm still amazed at how much I adored it and how much I learnt. I've never enjoyed a classic so much in my life. 2nd place goes to The Hunger Games by Suzanne Collins (originally reviewed here). This was the second book I read this year when I was still struggling and after forcing myself through Heat Wave by Richard Castle, I picked up this book and flew through the entire series in a week. The first book was always my favourite though and really reminded me what I love about reading. 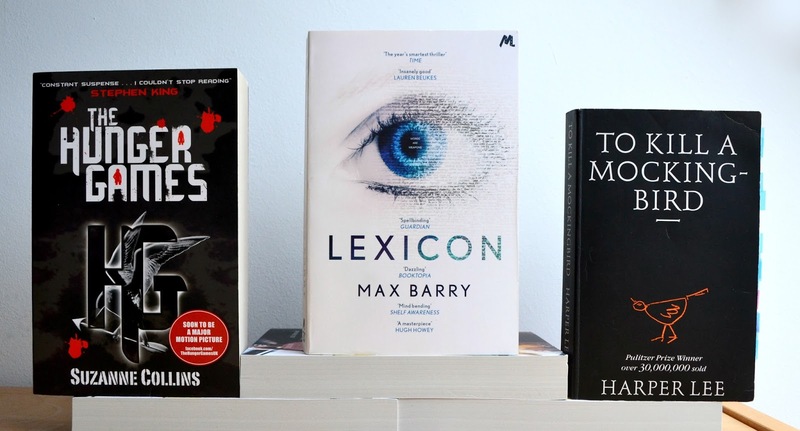 And 1st place goes to Lexicon by Max Barry* (originally reviewed here). I was blown away by the concept of this book where certain words have the power to take down peoples defences and make them do what you want them to do. I read this book in April and when I sat down to write this post I knew it was going to be 1st place. My friend bought this book off my recommendation and I lent my copy to my personal trainer and they both loved it. I just want to shove a copy into everyone I meets hands and yell "Read this!" because of how good this is. I'm doing a little blog survey to see what I can improve in the new year, I'd love it if you could take a couple minutes to fill it in here! How was your reading in 2014? What was your favourite book of the year? *I won this book from Goodreads. Luck was on my side that day!